As a performing musician, there are a couple of essential tools you need in addition to your horn. Here is what you should have if you are performing a lot. A Check List – The FIRST thing you should do create a check list of things you need to take to a gig. I recommend using some sort of iOS or whatever repeating task list. 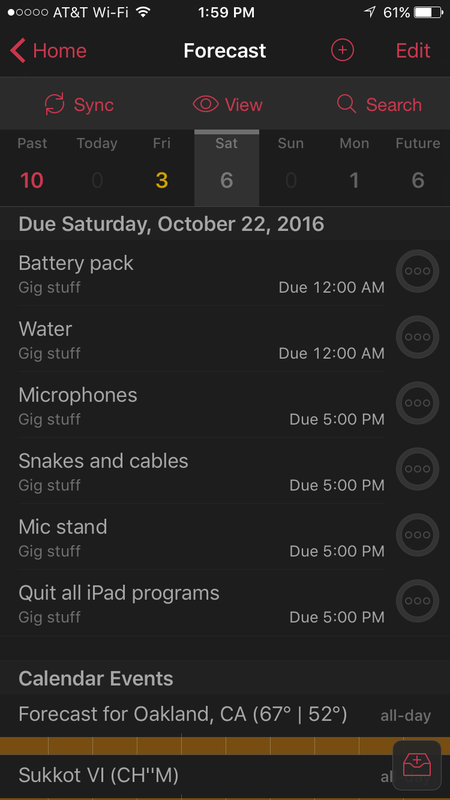 I use Omnifocus that I created a bunch of repeating items that show up Fridays. Things like “Water”, “Microphones”, “Snakes and cables”, “Bari Sax Stand” are on the list. Yes, obvious things. But things you NEED for the gig. You might be thinking “of course I’m going to remember the bari sax stand”….until you don’t and then either do the gig without it or have to turn around and go get it. Two of everything – There is a survival rule, “Two Is One and One is None” that supposedly comes from the Navy Seals. Popular youtube video creator GCP Grey has taken it a little further “Three is two, two is one, one is none” on his Cortex podcast. I generally try to have TWO of everything, sometimes three. Three extra reeds. Three XLR cables even though you need only one. Two microphones (though I usually have three with me). Extra batteries. Say you break a reed…..and the spare is sorta crap as well. You have another reed to try. Or if your microphone cable is crapping out on you….you have a spare. An extra mic clip in case your clip breaks. And an extra microphone just incase. Or if you need to maybe mic something else. If you use your iPad for music, it becomes a little more complex. I was usually carrying a binder of all the songs we might do at a gig, but that becomes cumbersome. I am lucky enough to have TWO iPads (the original iPad and an iPad 4), but if I didn’t have an extra iPad, I would probably put everything on my iPhone. The bigger screen iPhones (6 and above) are good enough to read in an emergency. All the charts are in Dropbox. Tape – Scotch tape, Electrical and/or gaffers tape. Useful to fix just about anything. I’ve had to use some electrical tape to fix my Sennheiser 421 when the clip broke. Took 30 seconds, and it was good to go. Screwdrivers and Rubberbands – To get that wayward screw back in the slot and maybe fix a broken spring. A Multitool – I find I use this a lot, especially the pliers. It’s good to use to bend a key back (use some tape on the gripper parts of the players to keep you key from getting groove marks). The knife comes in handy, as does the screwdriver (to adjust a microphone stand clip) and stuff. It’s good to have in the bag. These are things in my bag that I have found I need for a gig.